Figure 1: Climate change is increasing severe weather occurrences, including a prolonged drought in Colombia. Here at LUCA, we believe that Big Data can be a positive force for Social Good on key problems, including climate change. The urgency of the issue means that there is a need for clear and decisive action. But that action is only as good as the information we have about what exactly is happening, which is where Big Data can help. 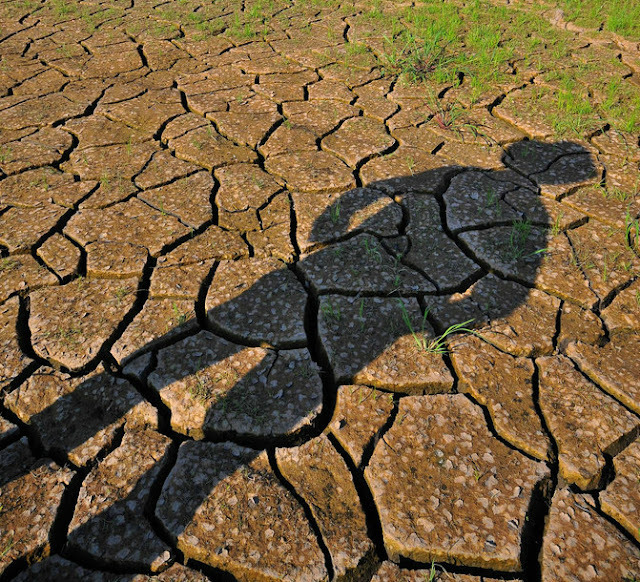 Enrique Frías, one of lead researchers in Telefónica and LUCA's R&D department, is currently working with a team to determine how Big Data can specifically address the issues of climate change migration. 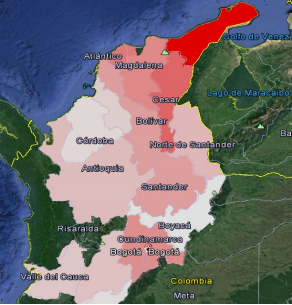 The team is in the midst of conducting a preliminary study in Colombia to determine how call detail records (CDRs) can help map patterns and provide additional insight about people forced to migrate due to climate change-related issues. Figure 2: Environmental migration occurs worldwide after natural disasters, but the problem is worsening with climate change. Environmental migration is nothing new, as it occurs almost every time there is a natural disaster, such as a hurricane or a tsunami. 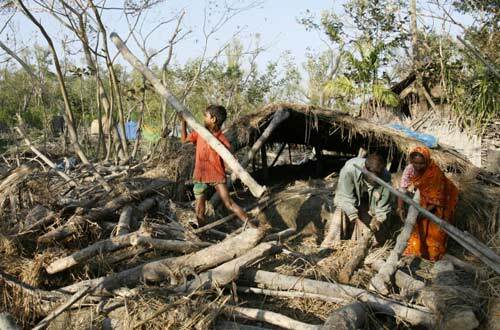 However, the volatility and severity of weather-related incidents are increasing due to climate change. This means that people are being compelled to move more frequently, and the duration of their displacement is usually longer, if they are able to return home at all. 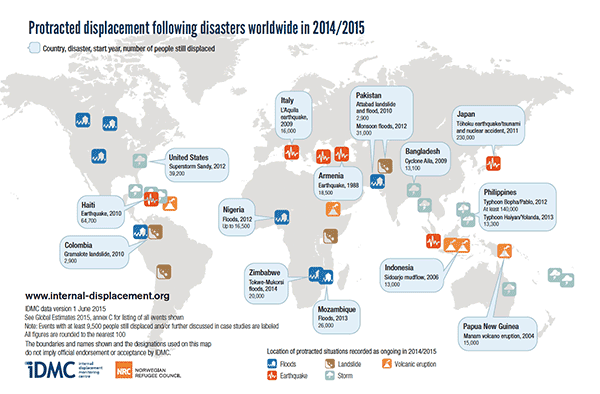 Research by the International Displacement Monitoring Centre (IDMC), a Geneva-based monitoring organization that tracks displacement around the world, shows that the trend of climate migrants is going up. Their 2015 figures estimated that 19.3 million people were displaced due to weather-related events in that year alone, not including people who were still in a state of displacement from weather events in previous years. Based on yearly data collected since 2008, IDMC concludes that this averages out to one person being displaced from weather-related events every second. Of course, it is difficult to pin down what extreme weather events are a direct result of climate change. But the link between climate change and extreme weather correlates with the increasing frequency and severity of these events, including droughts, floods, heatwaves, and hurricanes. This increase in extreme weather is expected to continue, which means that climate migration will only worsen. Frías and his team are hoping that their use of CDRs can help address this issue. They are conducting the preliminary study on a local level, focusing on the municipality of La Guajira in northwestern Colombia. La Guajira declared a state of public calamity in 2014 due to a severe and prolonged drought. The lack of water and the subsequent impact on the food supply forced many residents to leave their homes. The researchers tracked this movement using aggregated and anonymized CDRs to determine different migration patterns. According to their preliminary results, 90% of residents stayed in the larger municipality of La Guajira but moved to areas where the drought was not as severe. The other 10% scattered around other municipalities, primarily concentrated in the nearby areas. Figure 4: Map of climate migration movements due to the drought. Movement patterns are important to track because these migrants are often in need of significant aid. Being able to predict how and where they will move will allow for aid to be more targeted and effective. While not alleviating the issue of climate migration altogether, better-deployed aid can lessen the extent of the suffering. This research is still in the early phases, but we are excited at the initial results of the study. If it is successful on a local level in Colombia, it could be expanded and used on a larger geographic area, which would provide even more information about global climate change migration patterns. LUCA is already partnering with UNICEF's Magic Box initiative to use Big Data to tackle problems like natural disaster response and the spread of viruses. The potential to use Big Data for Social Good in the area of climate change would be a significant opportunity to make a tangible impact with data. Would you like to know more about this study? Check out the paper here.